The second principle of Leave No Trace is, "travel and camp on durable surfaces." To most seasoned backcountry travelers this principle seems obvious. They've seen the impacts and they understand. Walk on the trails. Don't cut switchbacks. And don't make new campsites when there are pre-impacted areas available. But this isn't always as obvious as it might seem. For example, the desert can be fragile. Cryptobiotic soil -- a biological soil crust -- can take up top fifty-years to repair itself. Alpine heather is also fragile, but takes far less time to regenerate. So, while the two surfaces are fragile and appear similar, the strategy for traveling across them is different. It should be obvious, but you should never climb on petroglyphs or on other archeological artifacts. Avoid the destruction of plants at the base of boulder problems by crushing them with your crash pad. Don't deface the rock with graffiti. Think about the impacts of approach trails before developing new routes. Flake ropes and sort gear on durable surfaces. In the alpine, try to urinate on rocks. This will keep goats from tearing up the ground for the salt in your urine. 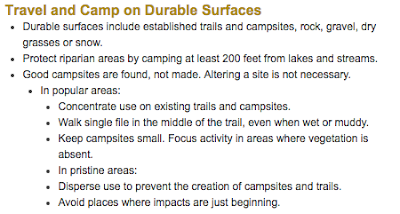 Following is a short quiz/tutorial from the Center for Outdoor Ethics and Leave No Trace on what constitutes a durable surface.